21 February marks the 150th anniversary of one of the most painful and contentious incidents of the Waikato War. 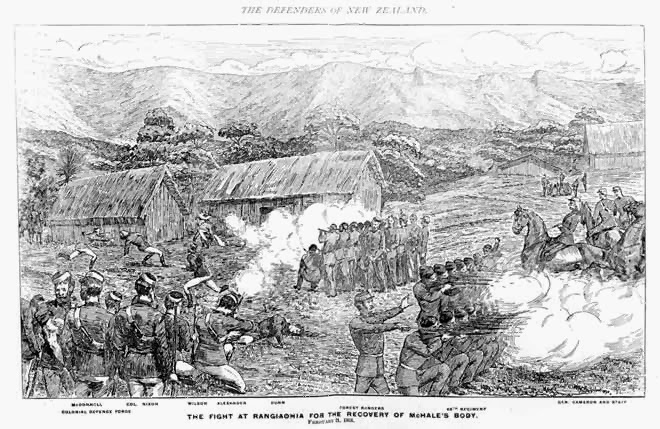 To call the British raid on the settlement of Rangiaowhia a ‘battle’ would be misleading. Most of the residents of the village were women, children and a few elderly men. Once British troops had bypassed the formidable Paterangi line of pa in the dead of night, Rangiaowhia remained more or less defenceless. It was attacked at the break of dawn on a Sunday morning, the fire from cavalrymen as they entered the village causing its startled occupants to run in terror in every direction. Some sought shelter in churches, others in their thatched whare. Some did not get away. Following the British attack on Rangiaowhia, the main body of Kingitanga defenders manning the Paterangi line abandoned their position, but suffered further heavy losses in their hastily constructed new defensive post at Hairini the next day.